If you’ll recall, we previously got you set up to translate your organization’s strategy into a top down vision with metrics in the blog, “Failing to Deliver Strategy… Slowly.” In addition, you started to create a plan to deliver iteratively and measure against the metrics allowing future work to be defined based on the results to date. But no one can do this alone—you need a strategy planning team to set up a strategic plan that the organization can deliver… fast. This fact alone is a large part of why strategic initiatives fail 50% of the time—it’s a large part of why organizations simply aren’t good at strategic planning. They don’t know how to approach planning an initiative if doesn’t have a certain outcome with metrics defined. But this is where your team comes in. Effective strategy planning will take multiple departments. Challenge your executives to begin translating strategy one step below the vague vision statement. Why? Strategy should be a priority across the organization and you want to be enable a strategic plan that sets the direction of success. Don’t have access to those at the executive level? No problem. When asking yourself who cares the most about strategic planning, the top answer is most likely executives. And you’re right. They are responsible for setting the vision. However, not everyone has easy access to those in the executive suite. You can absolutely approach upper management teams—directors, managers, those in finance—as they are responsible for delivering strategy, but they may be struggling with translating it into actionable plans. And, strategic objects are going to require multiple teams, areas of expertise, and change management since it often effective changes or creates new capabilities. Many don’t know where to even begin. Just to reiterate, who is a part of the process? Everyone, but it’s typically the leadership team that initiates the strategic vision. But they don’t always hand it off effectively, which presents a huge opportunity for the PMO, especially PMO’s looking to be EPMO’s. Do not hesitate to approach the executive level to take this on. If you are the PMO, you are in a great position to include IT, the business, and enterprise architects in this. Think about our strategic objective to use digital to connect and create loyalty through a digital customer experience? It is going to take, at minimum, IT, several areas of the business, and architects to deliver it and operationalize it. If you are still hesitant, remember, IT and digital are absolutely starting to impact how organizations do business, as they are no longer just about increasing efficiency, and CEO’s are expecting digital to increase profit margins by 84%. Clearly, they could have quite an impact on the strategic planning process. Now, let’s quickly review some of the main points of this blog. Try to reach those at the executive level, but if you can’t, go to directors, managers, and/or those in finance. As the PMO or the EPMO, you should start doing this. This is the future value you can bring to your organization. If you aren’t in the PMO, you can partner with them to advance their role in the organization. Teams should be able to be allocated to the plan. You now have the team, the defined metrics, and the beginning of a strategic plan. Stay tuned for part three in this series, where I will cover how to turn annual planning into continuous planning into the process. 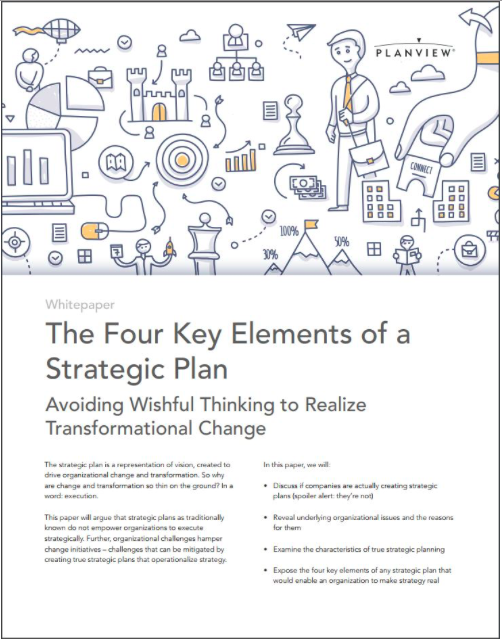 To learn more about strategic planning, download the whitepaper, “The Four Key Elements of a Strategic Plan,” and register for a free demo of Planview’s strategic planning solution. Carina Hatfield always has a plan. Throughout the years, she has improved her ability to respond and re-prioritize for new ideas and unplanned events. She followed her original plan of becoming a CPA going into budgeting, forecasting, and strategic planning until a new idea was prioritized and she took on the opportunity to join Planview. After six years of implementing Planview Enterprise to help organizations improve their strategic, forecasting, and planning processes, Carina has taken that experience and applied it to her role in Product Management.